Last month, on Lisa’s birthday, Clive jumped from the highest bungy in New Zealand and raised £2389 for the charity. He has written an account of his adventure which you can read here..
What a mega mad experience. Today we got up and drove down this steep 4WD track to “The Nevis High Wire”, a 134m drop from a cable car. We got in the cable car to the pod, suspended above the Nevis River and a huge valley. It’s the highest in NZ and I can safely say the most out of body experience I think I will ever have. Standing on the platform while the pod is swaying in the wind and feeling the harshness of the pure exposure to nothingness is very scary. But I had an excellent bungy helper talking me through it and after 3 I dove into the abyss. It’s the closest I will ever come to flying and the sound of the air as I fell was quite hair raising. When I was pulled back up I was so overcome that I got quite emotional with Jo at what I’d just done. Certainly worth $159 bucks! 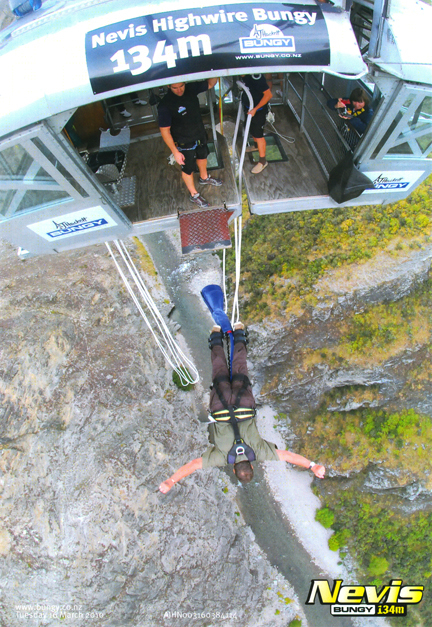 Was so taken with this new-found feeling I paid $50 to jump off another bungy (Adrenaline O.D or what). Now it was my turn. We travelled a few miles into Queenstown in our camper van and made our way to the centre where all sorts of adventures were on offer. At 10.45 we got on the bus with about a dozen other adrenalin junkies to make our way to the gorge about half an hour away. The bus was quiet with apprehension, as we approached the gorge the final climb of a few hundred feet had a sheer drop either side of the bus. We got off to see a huge reception area and lots of flat screen Apple Macs where people were viewing their jumps and sending them home by e-mail. Tricia and I were both put into a harness and joined our group of six overlooking the gorge, wow, awesome, we could see someone jumping off the platform in the middle of the gorge, the reality was beginning to sink in. We were introduced to our instructor and climbed in the cable car like vehicle and were attached to the roof by a cable so we couldn’t fall out. This was going to be dodgy I thought. It wasn’t too bad and a few minutes later we stepped onto the main platform, about 15 feet square, as soon as we had been hooked to the ceiling. I was told I would be first which surprised the lads who I think thought Trish and I had just come to watch! Trish stood to the side to view–she can be seen to the right of the pictures–and I sat in the jump seat. My feet were strapped and he explained how I had to pull the strap by my feet at the top of the first bounce to put myself upright. I had visions of arriving back at the top upside down. I was now attached with the heavy cable trailing behind me, I looked at Trish who took a picture and was asked to move to the edge of the platform as I peered over the edge. I had a job to move my feet, it wasn’t so much the weight of the cable but more about the words not registering and my brain not responding. There was no way I wouldn’t jump, I had travelled half way round the world to do this, there was a lot of money riding on it. I also thought that Lisa was the adventurous one in the family and she had got that spirit from me, she was a chip off the old block and there was no way I was going to let her down now. Sh.. I thought it’s a long way down, I got to the edge, was asked to smile and look at the camera, looked at Trish and he said he would count me down and I should dive. 4,3,2,1, a tap on the back and I just hurled myself into oblivion and, although I say it myself, it was a perfect swallow dive. I screamed Liiiiiisssssssaaaaaaa and somehow the release helped. What a rush the speed was awesome. Amazing I thought as I plunged towards the ground so fast, adrenalin pumping, now lets enjoy. 6 seconds later the bungy kicked in, a lovely slow declaration as the bungee kicked in. I bottomed out and the bungee bounced me back up. As I reached the top of the bounce, I reached up and pulled the strap to the left and was released into the upright position, gently bouncing as I took in the view. 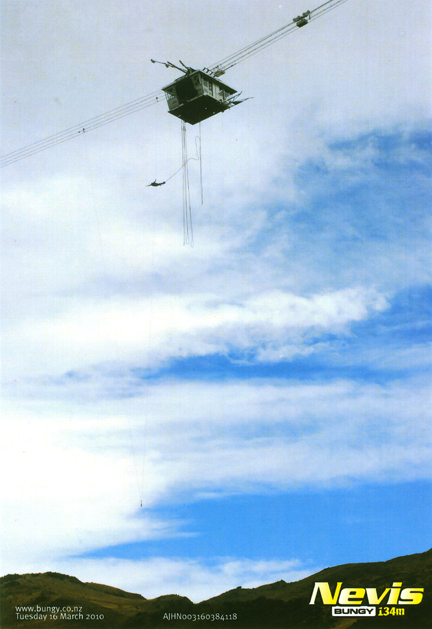 The winch started and I was heading back to the platform. It was a great feeling. Done it, I thought. As I arrived at the platform and saw Trish waving and smiling I could feel my eyes welling up. Lisa would be proud of her old man I thought, I now knew exactly what she had experienced and just what a it took to make the leap of faith. I was back and Trish gave me a hug, and the rest of our party wanted to know what it was like before they dove into the abyss. We watched everyone else do their stuff and celebrated with each one of them, we were now best of friends, comrades. We returned to watch our dvds and send them on. We travelled back to Queenstown where we celebrated with a pint and a lamburger, fantastic. Now I could relax and enjoy, the experience was really unforgettable, its good to push yourself occasionally beyond your comfort zone. When we got back to the UK I was amazed to find cheques for £2389 from our friends, family, suppliers and business colleagues. I WOULD JUST LIKE TO THANK EACH AND EVERY ONE OF YOU FOR YOUR SUPPORT. OUR TOTAL HAS NOW RISEN TO £184,000, 184 YEARS OF EDUCATION IN LISA’S MEMORY, SHE WILL BE SO CHUFFED THAT SO MANY PEOPLE CARE ENOUGH TO PUT THEIR HAND IN THEIR POCKET AND MAKE A DIFFERENCE TO THESE YOUNG ADULTS WHO HAVE OVERCOME ADVERSITY. It doesn’t stop here. Sunday, David Chattaway, the first recipient of the ‘Lisa Wilson Outstanding Achievement Award’ will be running the London Marathon (number 1762) in Lisa’s memory and to raise money for the fund. Gus Mckechnie last Sunday donated a cheque for £4000 for his amazing fund raising efforts over the last two years–rowing, cycling, iron man, etc–at a boat naming ceremony with Sir Robin Knox Johnson. Shortly to appear on the website. This year’s golf day on August 21st will push us closer to the magical £200,000 mark. The DeVere at Southampton has already been booked for the big bash next year, the ‘Sporting Legends Dinner’ on May 14 in memory of Lisa. On top of that there will be a very special naming ceremony for Tricia’s new foal, who is now a few weeks old.